was loaded with over eight million gallons of ethanol and other chemicals when it ran aground July 6 near Skamokawa, Wash.
Argent Cosmos, a Panamanian-flagged tanker loaded with chemical and oil products, had to be refloated late last week after it lost the use of a fuel pump and ran aground just before 6:30 a.m. July 6 near Skamokawa, Wash., close to the Oregon border, along the Columbia River. No damage to the vessel or injuries to crewmembers were reported, nor were there any reports of pollution in the river, according to the U.S. Coast Guard, which responded to the incident. The tanker, a seven-year-old, 557-foot vessel, is owned by Japanese transport company Mitsui OSK Lines (MOL) and managed by Singapore-based Tokyo Marine Asia. It was loaded with 1.63 million gallons of ethanol and 6.65 million gallons of monoethylene glycol at the time of the grounding, according to the USCG, as well as 458,074 gallons of high-sulfur oil and 99,064 gallons of low-sulfur oil aboard. The vessel was heading outbound after finishing a call at the Port Westward in Oregon when the incident occurred. 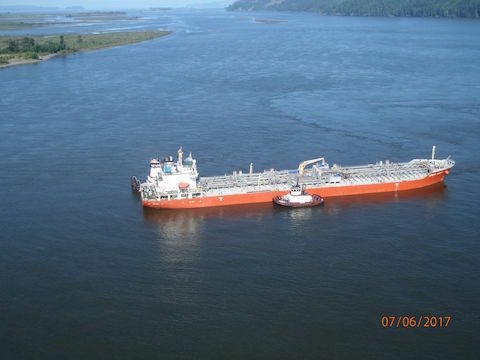 After the tanker was refloated with the incoming tide around 2:15 pm local time, it was taken back upstream to Longview, where it remained berthed as of the morning of July 10. Coast Guard Sector Columbia River commander and captain of the port Capt. Bill Timmons said he has placed a no-movement order on the vessel until Coast Guard inspectors ensure the safety of the environment and the crew aboard.